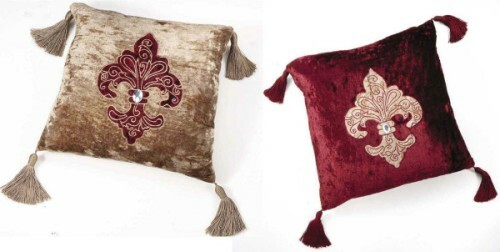 Pair of luxurious Belinda Miley pillows with Fleur de Lis embroidery. With Swarov tasseled corners. Comes in burgundy and taupe. Made of rayon polyester with polyester filling. Large- 18 in. D. Small- 14 in. D.